Francie just got a new job at the Uber-Mart clothing store. The only problem is she’s the only employee! 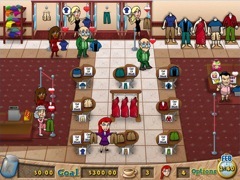 Help Francie run a fast paced clothing store by stocking tables, cleaning fitting rooms, running customer service, and checking out customers. It’s up to you to set the fashion trends by purchasing new clothing. And don’t worry about your mean boss! Complete the first year at Uber-Mart and then help Francie open up her own line of clothing stores from a posh upscale department store to a sunny beach boutique!